Subterranean termites are damaging and need to be tackled as soon as they are identified. Termites are very organized and it could be too late by the time you spot their presence in your home. To keep situations such as these at bay, you might want to give more attention to your property especially if you live in areas that are prone to subterranean termites. This is the only way you will manage to protect your property before any extensive damage takes place. As soon as you notice termites or termite damage, you need to call in the experts. They are best placed on dealing with the termites safely and effectively. Toro Pest Management knows the best termite control methods and products for a safe and effective pest eradication process for your property. Our pest control program is made up of six steps to provide you with an integrated approach in solving the termite infestation problem. 1. Inspection – We will inspect your property thoroughly to know the exact termite situation at hand. It will give us a clear cut on how to go about the control process and the best products and methods too. 2. Moisture control management – Moisture can largely lead to subterranean termite infestation as well as wood rot. We will manage moisture in the best ways possible. 3. Food source management – By eliminating the food source, it becomes easier to deal with termites for long term results. 4. Termiticide liquid barrier – We apply this to prevent termite infestations in future. It will keep them from getting into your property. 5. 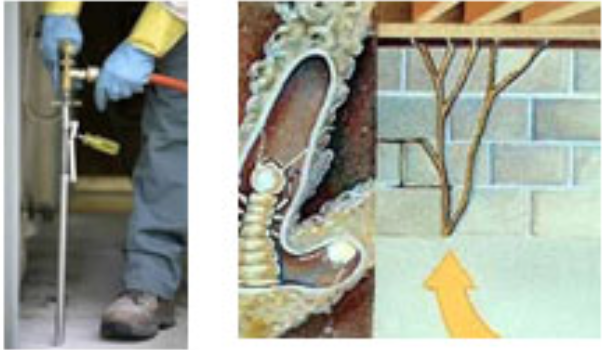 Termiticide foam – It is safe and effective in dealing with the termite infestations. Termite baits and monitoring stations – They are both part of our control approaches to make sure we achieve positive results with the termite elimination process. We will start by creating a protective barrier along your structure perimeter. The liquid barrier requires trench digging along the perimeter. This trench is usually one foot deep and one foot wide. This is followed by the application done through deep rod injection and complete area drenching. It is a method that kills the existing termites fast and easy. Next, we install the baiting system. Our system is well crafted to achieve the best of results. Here are the steps on how we go about the installation and how it works on your property. Baiting stations containing monitoring devices that serve as food for termites are placed strategically around your structure. The stations are inspected periodically. If the monitoring device shows any signs of activity, they are replaced with termite bait. Termites feed on the bait and take it back to their nest. Eventually, the colony is substantially reduced or completely eliminated. When there is no longer any termite activity in the station, your TORO service professional will replace it with another monitoring device, and continue to check it periodically.